The 2017 Vauxhall Crossland X is definitely not a Peugeot 2008 with a Vauxhall body. 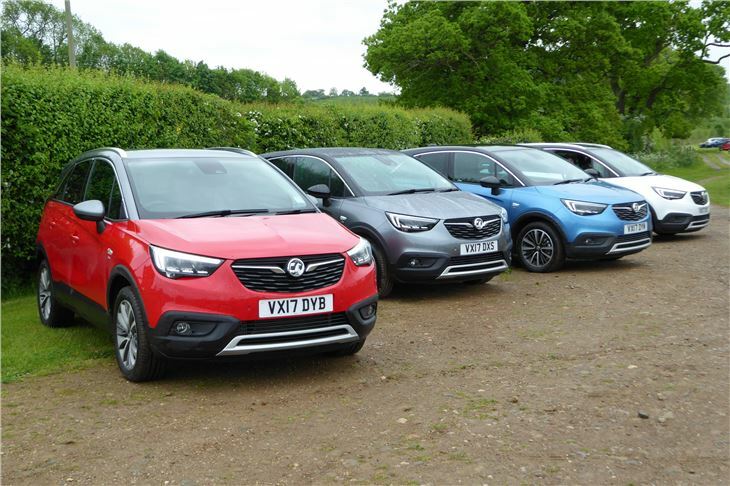 Vauxhall’s PRs were at great pains to emphasise this. Though drivetrains are the same as the 2008, the Crossland X shares a new platform with the forthcoming Citroen C3 Picasso replacement. 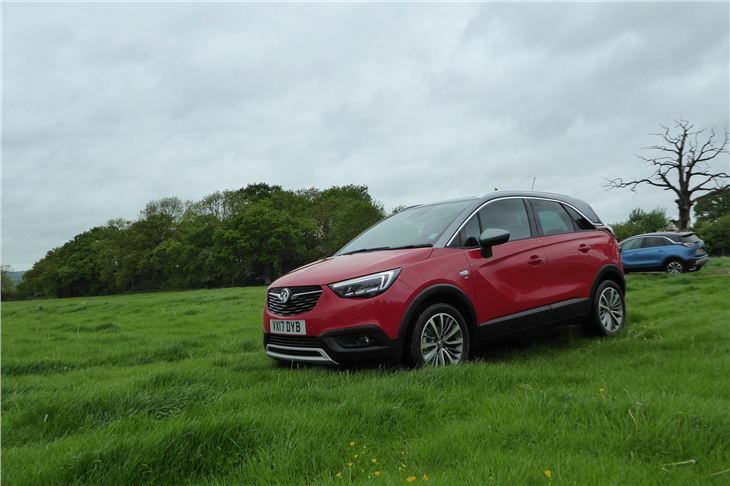 And, unlike the Peugeot, 2008, the Crossland has no off-road or all weather pretensions. 16-inch and 17-inch tyres sizes are the same, but there is no trick-diff ‘Grip Control’ and it comes on summer tyres. 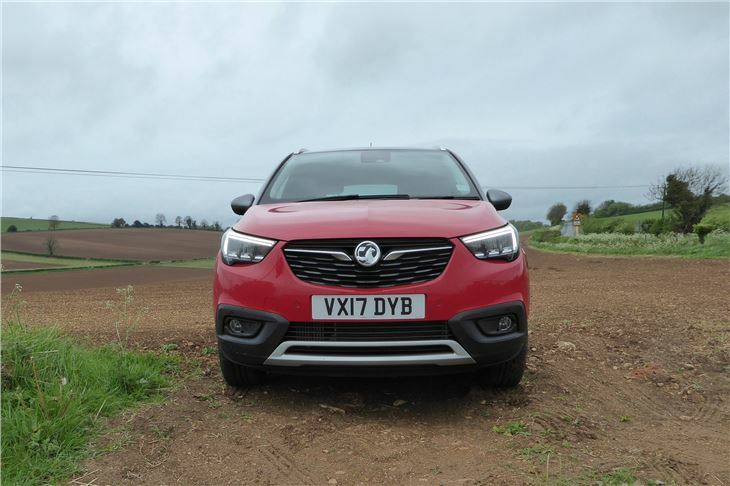 Vauxhall asserts that if customers want off road capability they can get that in the slightly larger Mokka X, and if they want better cold weather performance they can simply fit a set of all weather tyres. 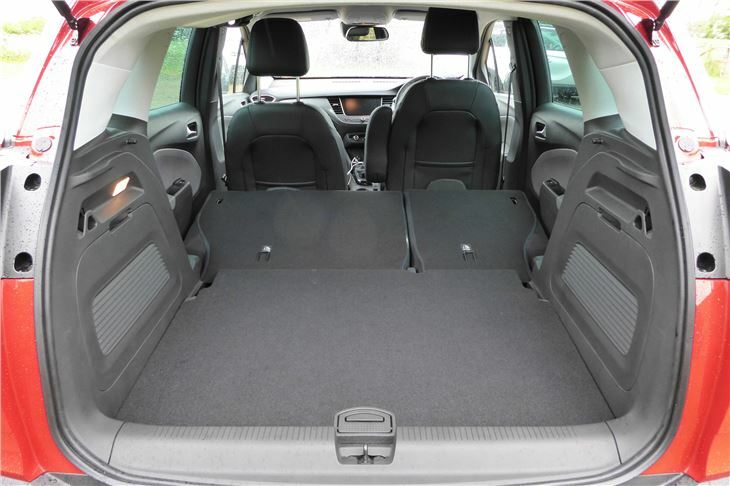 The point of the car is to offer a raised seating position and a versatile load deck in a compact vehicle, which are the main reasons for the popularity of SUVs anyway. The false ‘landau’ styling, similar to the Vauxhall Adam, is by Richard Shaw (not Mark Adams) and is emphasised by a black, metallic grey or white roof, though you can option this and the chrome strip out. 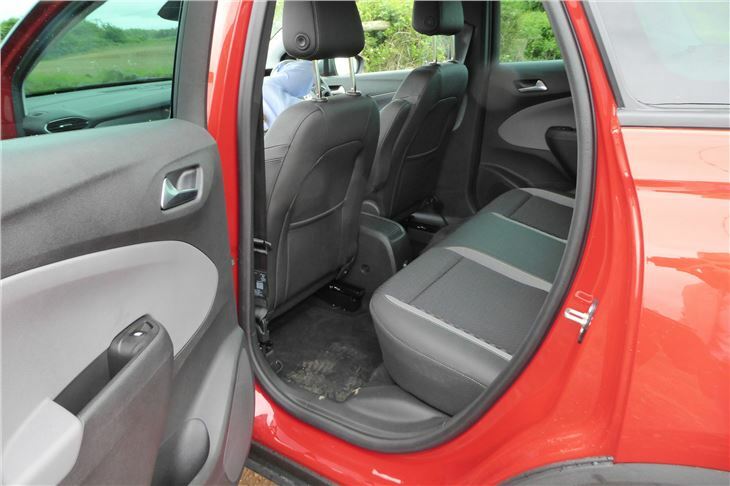 The car sits quite tall and the height adjustable front seat have a considerable range of adjustment to suit most driver statures. But even on the lowest setting the car feels quite tall on roundabouts. 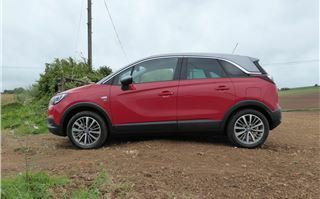 It grips and steers well enough and the ride on 215/50 R17 tyres is okay, but not as good as a Peugeot 2008 with Grip Control and softer all weather tyres. Unlike the 2008 the Crossland X has the option of a sliding rear seat giving 73mm (3-inches) more loadspace and, of course 73mm less rear legroom. 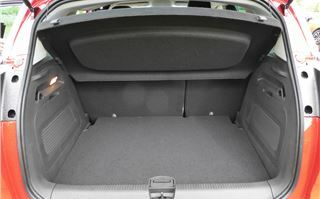 The ‘Flex Floor’ load compartment allows for a reasonably flat deck with the rear seatbacks down and the option to drop it about 3-inches to accommodate more luggage. 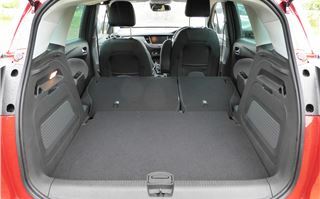 Under that you can option a spare wheel for an extra £110 (and I would). We drove what the Vauxhall calls the “Elite 1.2T 130PS S/S”, which corresponds to the 2008 1.2 PureTech 130 GT almost exactly in price. It goes just as well. 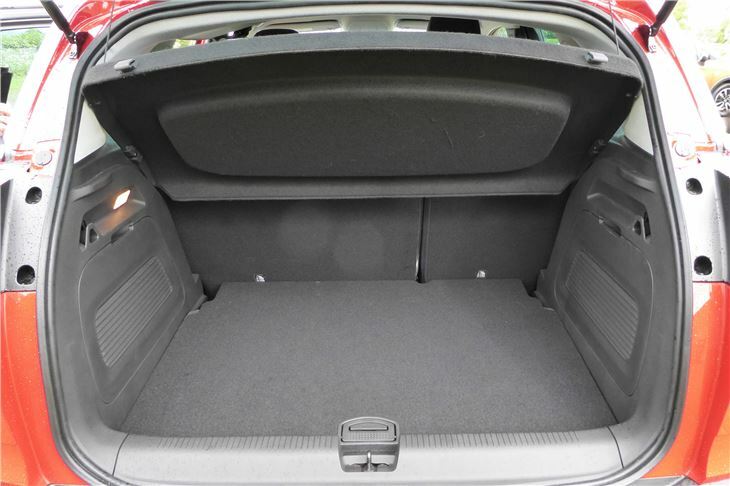 Remarkably well for a 1.2 and, if the Peugeot 308 1.2 PureTech 130 I ran for a year is anything to go by, it should deliver close to a genuine 50mpg. 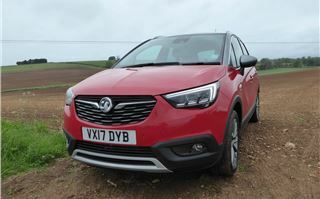 Even basic Crossland X models come with quite a lot of tech, as you can see from the list in the specs section. All have a 7-inch ‘R4.0 Intellilink’ touch screen angled towards the driver. An 8-inch screen with ‘R5.0 Intellilink’ comes with ‘Nav’ models. You get Apple CarPlay and Android auto. 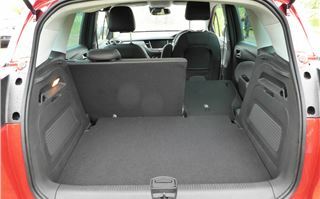 In theory you can connect a phone and used the phone’s satnav on the screen but, as has happened before (in the Skoda Fabia) the information can be a bit flaky if trying to send you on a circuitous route via waypoints. Give it a straightforward single destination and it’s fine. 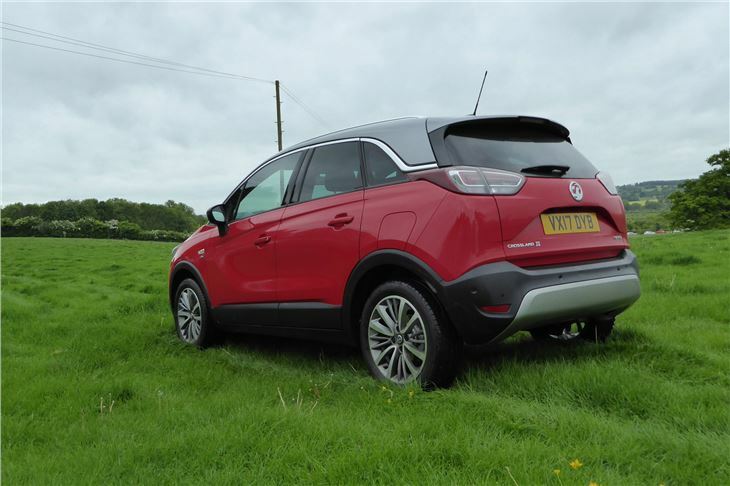 There’s a 180 degree ‘surround’ rear camera together with an ‘bird’s eye’ pictogram to make reverse parking easier. 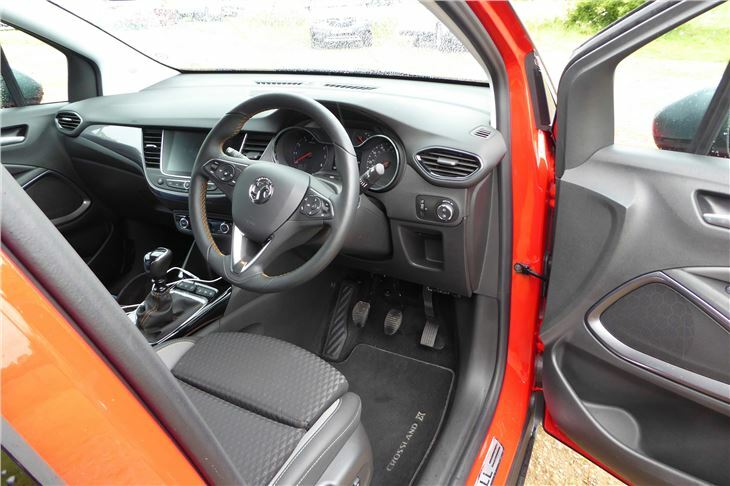 And options, such as an advanced self-parking system that steers you into parallel parking places or 90-degree slots. As with virtually any new car these days, you can also option pedestrian protection and automatic emergency braking. This stops the car dead from under 20mph if you are about to run someone over, and starts to brake the car if a collision seems imminent at between 20mph and 50mph. 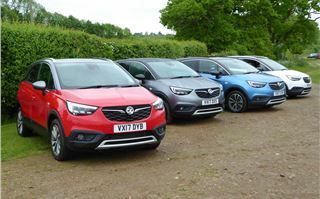 It’s worth pointing out that the Vauxhall Mokka is currently the best selling ‘B’ size SUV in the UK, though possibly this has something to do with discounting and the fact that 55% of Mokkas go to fleets. 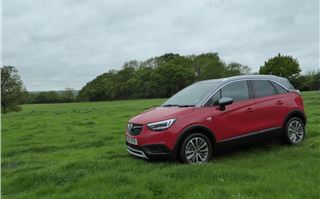 The Crossland X is expected to appeal more to private buyers with 65% of sales going to them. Should you or shouldn’t you? There’s a lot of competition. 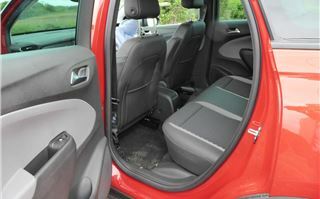 But the styling and the colours have a lot of appeal while the 1.2T 130 offers an excellent combination of performance and economy for a small SUV.